A hitherto secret report commissioned by the Hospital for Sick Children in Toronto has been introduced as an exhibit at the Goudge Inquiry. On May 31, 2005, I reported in the Toronto Star that the missing exhibits from the Mullins-Johnson case had been found by officials from the Chief Coroner's office. The missing exhibits had been found on top of Dr. Charles Smith's desk in his office at the Hospital's pathology department during an audit of forensic materials which had been ordered by then Chief Coroner Dr. Barry McLellan. The story contained an interview with Hospital spokesperson Helen Simeon, who said that Dr. Smith had agreed to go on administrative leave pending a review by an "outside" pathologist. Simeon, said Smith had been allowed to return to his work on non-criminal autopsies after the reviewer reported that Smith was doing a satisfactory job. Simeon declined to identify the reviewer or release the report. I have always wanted to see this report with a view to discovering how thorough the review process was - and whether it was sufficient to protect the public. I was therefore intrigued to discover earlier today that the entire report was only four paragraphs long. In 2001, Smith was removed from the roster of forensic pathologists permitted to conduct autopsies in suspicious deaths. A year later, three complaints to the Ontario College of Physicians and Surgeons relating to his work in suspicious death cases were upheld. It is addressed to Dr. Ronald Laxer, a Hospital for Sick Children Vice President, and runs under the heading Re Pediatric Surgical Pathology Review." I was requested to review pediatric surgical pathology cases to determine the appropriateness of diagnoses made by Dr. Charles Smith and to form an opinion as to whether the overall performance of Dr. Smith based on this review, is at a level expected for a pathologist working in a pediatric hospital such as Sick Kids. I have completed the review of 60 surgical pathology cases that in my estimation reflect a spectrum of challenging interpretations and that have, predominately, important implication for patient care. Foe each case I examined all pathology slides without knowledge of the content of Dr. Smith's report and formed a diagnostic opinion. After which, I studied the pathology report and compared my diagnosis with the reported diagnosis. On each case I scored for agreement, minor disagreements with no or minimal patient consequence, or major discordance with serious implication for patient care (as per scoring sheets provided). Of the 60 surgical pathology cases I concur with Dr. Smith's diagnosis in 57. In the remaining three we disagree in a minor way that has no implications for patient care. In general I find Dr. Smith's reports to be appropriately informative, thorough and diagnostically accurate. Extrapolating from this review, the process of which I believe to be appropriate assessment, I conclude that his performance is at a level expected for a pediatric pathologist in a sophisticated children's hospital dealing with complex diagnostics." The letter is signed by James Dimmick, Consultant Pediatric Pathologist, Professor of Pathology and Laboratory medicine, University of British Columbia. This Blogster is not questioning in any way the integrity of Dr. Dimmick's report. My concern, however, is that given Dr. Smith's unfortunate history at the Hospital for Sick Children - on both forensic and non-forensic pathological matters - Dr. Dimmick should have been asked to do more than study microscopic slides. Dr. Dimmick should have been instructed to report on whether he believed that Dr. Smith has the "integrity" to continue to work as a pathologist at the Hospital for Sick Children. To fulfil this mandate he should have been permitted to visit Smith's working place, inspect his chaotic office where so many key forensic exhibits had been misplaced, to interview Dr. Smith in depth, to assess whether he had the requisite knowledge, capability and balance, and to interview his colleagues to get their views as to Dr. Smith's strengths, weaknesses and character. I do not get the impression from Dr. Dimmick's letter that any of this was done - and I am confident that if these steps were taken, they would have been laid out thoroughly as is customary in reporting letters. We are now aware that in 1997 Dr. Smith came under considerable criticism by other physicians and surgeons at the Hospital for erroneous interpretations of histological samples - and that he was struck from the surgical pathology roster until he completed an educational program - and that his salary was reduced accordingly. We are also are aware that Both Deputy Chief Coroner James Cairns and former Chief Coroner Dr. James Young, testified that the Hospital did not inform them of Smith's flawed work, requirement to take courses, and reduction in his salary. I am wondering if the Hospital communicated this information to Dr. Dimmick - so that he would be able to probe whether Dr. Smith had improved his knowledge in those areas where his interpretations had been flawed. This Blogster personally believes that the Hospital's "outside" probe of Dr. Smith did not go nearly far enough - and makes me wonder whether the Hospital might be putting its own interest and that of Dr. Charles Smith before that of the public. On Sept. 12, 2005, I reported in the Star that Dr. Smith had tendered his resignation and departed from the hospital in July. The resignation was tendered just several weeks after June 7, 2005, when former Chief Coroner, Dr. Barry McLellan, announced an unprecedented review of all cases handled by Smith at the hospital since 1991 where he had performed an autopsy or provided an opinion. Simeon said she was unable to say why Smith resigned because that information is confidential. Dr. McLellan said he felt compelled to order the review, which will revisit the deaths of more than 40 children, "in order to maintain public confidence in the coroner's office." MS. LINDA ROTHSTEIN: DID YOU BELIEVE ANY ASPECT OF DR. SMITH'S DESCRIPTION OF THE EVENTS? DR. CAIRNS: SADLY, I DID NOT. Previous postings have detailed Smith's retention of the small, dark, curly, pubic, male-type hair in the Waudby case, the fact he had the hair with him in court (while denying knowledge of it under oath), discussions among police as to laying criminal charges against Smith, and Smith's claim that Dr. Huyer, a sexual abuse expert , had attended at baby Jenna's autopsy. Dr. Cairns testified Tuesday that he disbelieved Smith's claim that Peterborough police would not accept the hair, that he did not believe Huyer was present at the autopsy, and that he was utterly shocked by Smith's behaviour - and that in spite of these revelations that went to the heart of Smith's integrity, he was permitted to continue doing other (non-criminal) work for the Coroner's Office. picked up the phone and called Dr. Smith about the hair? knowledge, I had not spoken to Dr. Smith about the hair. media, in fact, learned about the hair recovered from Dr.
that's caused being in the media. some concern on the part of Dr. Smith or his spouse? that that was unfair, and we should be supporting him. there for a moment. Dr. Smith's wife was a coroner? result of her status as a coroner? social relationship with Dr. Smith and his wife? relationship with either of them. I met -- I knew Dr.
Smith, pure and simply, through work. wife, Karen, said to you in that phone conversation? result of the furor in the media. anything, did you say to her in return, Dr. Cairns? your convenience, in my office to discuss that further. first went public with the information about the hair? the Chief Coroner's Office to go to government. call somewhere between February 5th, 2002 and? MS. LINDA ROTHSTEIN: Mid April of 2002? actually, as opposed to the 5th. MS. LINDA ROTHSTEIN: Did I say the 5th? very much. I meant the 14th. meeting, how long after your telephone call with Dr.
what time of day it was? DR. CAIRNS: It was the afternoon. DR. CAIRNS: It was in my office. DR. CAIRNS: I made no notes. preparation of this, I had a meeting with him. meeting as I have now. it Dr. Karen Smith or Dr. Charles Smith, both of them? that I put to them. did the meeting begin, what did you say to them? nature in the vaginal area of Jenna. asks an IDENT officer to take a specimen, they take it. autopsy report that that occurred? and highlighted to -- to that effect? report, and I was told, No, I don't have rough notes. hair in the vaginal region. Charles, how can say that in light -- at that time? envelope in my jacket pocket at the preliminary hearing. - to which there was no answer. about all of this, Dr. Cairns? that he thought Dirk Huyer was at the autopsy with him. difficulty with that, as well. I know Dirk Huyer; he's on the SCAN Team. of evidentiary value or not later is a different issue. not have -- would -- would not have ta -- taken the hair. reinforce in my mind that Dr. Huyer had not been there. aspect of Dr. Smith's description of the events? coroner's warrant at Sick Kid. very difficult conversation with Dr. Smith and his wife. criminal suspicious and homicide cases. Am I correct? you had following this meeting? 22 situation before the meeting as well, sir. in this; you're making that clear? others the conversation that we had. not removed from the PDRC? from the Death Under Two Committee? from the Death Under Two Committee. hold his title as the Director of Ontario's OPFPU? DR. CAIRNS: That is correct. COMMISSIONER STEPHEN GOUDGE: Why not? investigation of -- of Jenna's death. in the ongoing Jenna case. Is that what you're saying, sir? con -- criminally suspicious cases. it's very difficult to do? DR. CAIRNS: Yes, I do. more was likely called for? MS. LINDA ROTHSTEIN: At that stage? DR. CAIRNS: Yes, I agree. MS. LINDA ROTHSTEIN: All right. Dr. James Cairns testified Tuesday that he was not the only one to place Dr. Charles Smith on a pedestal. "Having read many court transcripts, I feel my opinion was shared by many defence lawyers and Crown attorneys; by many judges; and by many in the media," he told Commissioner Stephen Goudge. Dr. Cairns had the direct responsibility of protecting the public from the actions of those under him - the others did not. This is a seductive, but dangerous explanation. It should not be allowed to detract from the positions of public trust Dr. Cairns and other officials of the Chief Coroner's office occupied. Nor should it stop us - and the Goudge Inquiry - from attempting to discern if there are any other reasons why Dr. Smith was not brought to account. This Blogster has a pet theory - which may or may not be borne out by the evidence. As the the list of Charles Smith disasters began piling up in the late-1990's, the Coroner's office woke up to the distressing fact that it had allowed Dr. Smith to handle virtually every serious suspicious death of a child case since 1991 - and had placed him on the "pedestal" that Dr. Cairns referred to in his evidence. In short, they had placed all their eggs in one basket. Once word got out about Dr. Smith's disastrous performance in any one case - his performance in every case he had been involved in would come into question. From that point on, the media would be up in arms, the government would feel the heat, there would be endless civil lawsuits and criminal appeals, and, worse, the work of the Chief Coroner's office over these years when the miscarriages were piling up, would come under intense, critical scrutiny. Ironically, because no action was taken against Smith, this is precisely what eventually took place; Former Chief Coroner, Dr. Barry McLellan ordered his independent review of 45 suspicious death cases to restore "public confidence" in the chief coroner's office; Attorney General Michael Bryant established the public inquiry now under way; civil cases against the police, the government and the coroner's office abound; and the Ontario Court already has so many appeals it could set up its own Charles Smith courtroom. I underline the point that this is just a theory - not backed up by any evidence called thus far at the inquiry. But it makes more sense to me than the explanation that Dr. Smith hoodwinked so many powerful people into thinking he was God and overlooking evidence staring them in the face that he was in utterly over his head, and leaving behind an ever-growing trail of miscarriages of justice. DR. JAMES CAIRNS TO THE GOUDGE INQUIRY. One of the most telling moments thus far at the inquiry occurred yesterday (Tuesday) when Justice Goudge asked Dr. Cairns whether there could be an effective peer review, "of the icon in the field." DR. CAIRNS: I think you've hit the nail on the head. It's -- it's very difficult when you get to icon status to -- to take people down from that icon status. maintained that iconic status so long? "I felt that his religious aspect made it unlikely that he wasn't telling the truth." "Cairns, who has worked closely with Smith for a decade, calls him "a wonderful asset" in the investigation of child deaths. "He's a friend. I admire his work and he is greatly admired at the Hospital for Sick Children," Cairns told Maclean's. "He's done a tremendous amount of good over the years. His sincerity is beyond reproach." Smith himself did not respond to numerous interview requests from Maclean's. Cairns said the recent controversies have taken a toll on Smith. "He's not one of these Teflon people who says I don't give a damn what people say," said Cairns. He noted that his colleague had been involved in many successful legal cases..."
Dr. Cairns relationship with Charles Smith - in the context of the Maclean's article - came up in yesterday's evidence. "Dr. Cairns also testified that he had no social relationship with Dr. Smith, only to be confronted with a quote from an unpublished 2001 media interview in which he described Dr. Smith as a personal friend. How could Dr. Cairns purport to review his work objectively? Ms. Rothstein asked. "It not only should have disqualified me, it probably should have disqualified the whole office," Dr. Cairns said. "O'Hara also delves into the religious facets of Dr. Smith's life. "Most Sundays, Smith is a pillar of another community," she writes. "He is an elder in a newly formed evangelical congregation that meets in a high-school auditorium in Richmond Hill, 30 km north of Toronto. Two years ago, Smith and his wife, Karen -- a family doctor and part-time coroner in nearby Aurora -- left their old parish and volunteered to help start this satellite church as part of their mission to bring new converts to the Christian & Missionary Alliance. It's a Christian denomination that emphasizes "world evangelization" and boasts 2.5 million followers in 40 countries. While Charles Smith chats with churchgoers after the service, Karen sells audiotapes of the pastor's sermon." This humble Blogster finds it somewhat strange that a C.V. prepared for use in court - in the context of the expert qualification process - would list religious affiliations. 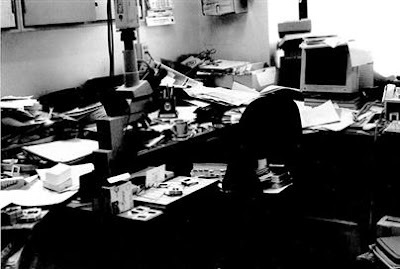 This is the photo of Dr. Smith's office taken by a staff member of the Hospital for Sick Children in 2001. It was filed as an exhibit at the Inquiry. JUSTICE BRIAN TRAFFORD: KPORWODU AND VENO;"
Photographs of Dr. Charles Smith's office at the Hospital for Sick Children taken in 2001 reveal a horrific mess. As Deputy Chief Coroner Dr. James Cairns described in his evidence yesterday, "It was the most untidy office that I've seen." "I know that there are people who are excellent that although it looks chaotic, they know everything's in its right place and don't touch it, because they know where to find it" Cairns added. "I did not get the impression that this was organized chaos." Dr. Cairns also noted that although all of the pathologists at the Hospital had "cubby-holes" for offices, "the other offices were not in the same state of disarray." This was the same evidence where Dr. Smith had kept the dark, curly, male pubic hair, he had held on to for years in the Waudby case - evidence that possibly would have implicated at the outset the teenage babysitter who later pleaded guilty. This humble bloggist has seen crime scenes that were more orderly during his career as a reporter for the Toronto Star. As reporter Tom Blackwell wrote yesterday in the National Post, the photos, introduced into evidence yesterday,reveal Smith's office at the Hospital for Sick Children as, "a room over-flowing with files, loose papers and tissue-sample slides." "Somewhere in that desk top jumble a key piece of evidence gathered by the pathologist went missing for four years." But it also raises serious questions about the Hospital for Sick Children, the Chief Coroner's office and the Ontario Government. Smith's Superior's and colleagues - who were well aware of the importance of his work for the Chief Coroner's office - must have been in that office countless times during the more than the many years he was on the Hospital Staff. How could they not have been aware that Dr. Smith's scattered working conditions could impact negatively on his important work and require him to cleanup his act? Dr. Cairns testified that he had been at the Pediatric Forensic Pathology Unit at the Hospital many times. Why wouldn't he have realized there was a serious problem here and taken serious steps to clean it up - especially after reports began mounting that Dr. Smith was failing to produce reports in a timely fashion, was losing key forensic evidence, and that he had stopped returning phone calls from police officers, prosecutors and coroners? Dr. Cairns testified that the Hospital viewed the matter as a problem of resources and was seeking more money from the government to improve the situation. Since Dr. Smith was a staff member of the Pathology Department why didn't his superiors at the Hospital take administrative action to rein in Dr. Smith? And what about the Ontario government which was paying the Hospital to house the Pediatric Forensic Pathology Unit according to a written agreement? Why wasn't the government - presumably the Solicitor General - sending in its own inspectors to ensure that the unit was adhering to the highest standards of protecting evidence for use in court? My take is that neither the Hospital, the Coroner's office, or the government felt the need to exercise some control over Dr. Smith until it was too late - and the havoc Dr. Smith was creating time and time again began spilling out into the public record. Dr. Smith's irresponsibility was staring them all in the face - yet they stood back and let him carry on. The public deserved so much more - from all of them. Goudge Inquiry: "Thinking Dirty: Dr. Cairns Defends "The Indefensible;"
This blogster was surprised to hear Dr. James Cairns, Deputy Chief Coroner attempt to defend the idea of "thinking dirty" which became an official policy in 1994 when it was circulated to Coroners, pathologists and polices services across Ontario. "The police and the coroner are both at a scene as independent parties," said the memo which was circulated by then Chief Coroner, Dr. James Young. "While working together they should also be prepared to vigorously, but fairly, question each other's conclusions about the death. Everyone should be "thinking dirty" and not get lulled into accepting the most obvious conclusions at the beginning of an investigation." This was not a few lines spouted from the podium of a coroner's conference. It was an official document containing instructions from head office. It was the party line. I was surprised to hear Dr. Cairns defend this policy - using an example that all car accidents may not be innocent - because the policy, which was discontinued ten years later when Dr. Barry McLellan became chief coroner, is indefensible. The evidence that it is indefensible lies in Dr. McLellan's stated reason for ordering a review into forty-five suspicious death of children cases in which Dr. Smith was involved, in order to restore public confidence in the coroner's office. The evidence also lies before our very eyes in the twenty cases before the Goudge inquiries in which dirty thinking turned the most innocent but unfortunate falls, bumps of a child's head on a table, or the mere fact that a child's death could not be explained into homicides - and invariably into criminal charges. Worse, the evidence lies in the all too many individuals who went through so much agony because of a policy based on suspicion rather than the dictates of science - a policy that turned doctors into police officers- and made heroes out of those who could boast that they, in true CSI fashion, had detected crimes. But to Dr. Cairns, "thinking dirty" was just another slogan - as he put it, "like the Nike Swoosh." When Commissioner Goudge pressed Dr. Cairns as to whether "thinking dirty" was akin to a presumption of guilt, Cairns replied: "No, it was not a presumption of guilt. It was to ensure that you haven't missed a homicide." In this Blogster's humble opinion the coroner or pathologist should never be burdened with considerations of guilt or innocence. His or her job is to independently, thoroughly and impartially gather the evidence - no matter where it may lead - and to ground all findings on the of science as opposed to suspicion or ideology. We have all seen - through the evidence called thus far the inquiry - what happens when this isn't isn't the case. Leave the policing to the cops. Goudge Inquiry; Sharon's Case; Part Eight; The Unravelling Of An "Expert." "HE (DR. CHARLES SMITH) WISHED ME GOOD LUCK AT THE MEETING AND SAID THIS IS ONE CASE HE WISHED HE HAD NEVER SEEN;"
FROM PROSECUTOR ED BRADLEY'S NOTES OF A TELEPHONE CONVERSATION IN WHICH DR. SMITH CONCEDED THAT HIS OPINION THAT SHARON HAD DIED BECAUSE OF KNIFE AND SCISSOR INJURIES WAS WRONG - AND THAT THE DEFENCE EXPERTS WHO SAID THE INJURIES WERE CAUSED BY A DOG WERE RIGHT. As has been demonstrated by previous posting on this Blog, the "Overview Reports" prepared by Commission staff contain some extraordinary information which most likely would not have seen the light of day had the Inquiry not been called. One of the treasures are notes made by Prosecutor Ed Bradley of a phone call he made to Dr. Smith on January 11, 2001. All of of the defence experts agreed that Sharon's injuries had been inflicted by a dog - not by knives and scissors - and now they were supported by Dr. Symes, a leading American expert on bone injuries. Sharon's mother had been put through hell, kept in custody, and confined in a half-way house on a charge of murdering her daughter as a result of Dr. Charles Smith's pivotal opinion. Now it looked like Sharon had been killed by a dog. Worse, Bradley was now well aware from his colleagues and other sources of the often well-founded attacks that had been made on Smith's competence and credibility in other cases involving the deaths of children. So one can imagine how Bradley felt as the conversation progressed to a denouement in which Smith agreed his critics were right, and wished him (Bradley) "good luck" adding that, "This is one case he (Smith) wished he had never seen." I had tried to reach Dr. Smith for several days prior to Christmas and was unsuccessful. I then tried to reach him by calling his office and he was able to give me some time and answer my questions. I started by asking about the marks on the skull as 6 or 7 of the 8 or 9 marks on the skull were described as being incision marks and it was pointed out to me that since Dr. Symes says they were created by a sharp knife or scalpel cutting at an angle perpendicular to the surface that they were either created with the scalp in tact or after the scalp had been removed. The area of these marks is the right posterior portion of the skull in an area where it appears the scalp had been removed. With this in mind I asked Dr. Smith how closely he had examined the portion of the scalp that had been removed. He indicated to me that he just did a gross visual examination as the concern at the time was to get it examined for head lice as that was indicated as a possible motive for the attack. He also said that he issue of any Marks on the skull were not of primary concern other than those that were readily visible to the human eye as at the time it seemed obvious that the other wounds were stab wounds. He said the only marks he observed on the removed portion of the scalp were the gross marks indicated in his drawing. He cannot say whether or not there were 6 or 7 incision marks in the removed scalp. He packaged up the scalp and sent it to the U.S.A. to be examined for head lice and he did not see it again for 11 or 12 months. At that time he said the scalp was not in a condition to examine it closely. I then asked him about the injury in the thoracic inlet (the neck wound). I read him the long paragraph from Dr. Ferris' report on page 4 (fax page 5). It's the first complete paragraph on that page. I asked him what he thought of those comments and he said he could understand where Dr. Ferris was coming from. I then asked him if he could refute Dr. Ferris' comments and he said he couldn't although in his heart he thought they were wrong. I asked him what he meant by this comment of his (Dr. Smith that is). He stated that he never measured the depth of the wound as that didn't seem important at the time (note: this is consistent with what he said to Det. Kennedy and myself in Sept. 00). Dr. Smith then went on to say that he had thought about this wound since our meeting and that it was quite likely that the photo of the scalpel handle in the wound was inserted to the full extent of the wound (note: this is the first time he told me this). If is (sic) the full extent of the wound as he now thinks is likely then Dr. Ferris' observations are accurate. I asked him if the injury in the neck was consistent with a knife wound or was it approx. circular in appearance. He said it was roughly circular in appearance and was definitely not an injury indicative of a knife. I asked about all of the as to whether any of them were indicative of a knife wound and he said all the wounds were basically circular in appearance although a couple might have a bit of triangular appearance. I asked why he thought initially that scissors were involved and he said it was because of the somewhat circular appearance and the so-called bifurcated (sic) that he saw (2 or 3 of these). I then asked him about the bifurcated wounds and put to him the suggestion of this cause as had been suggested to me by Dr. Cairns. I said if the defence were to suggest that the dog had bit through the skin surface then had loosened its grip slightly and then reasserted its grip (assuming the victim moved slightly or the dog moved slightly) could this explain the two channelled injury? He said yes, this would be an explanation for what he saw. I asked if he had read Dr. Symes report and he said he had. I then asked if he had heard of Dr. Symes and he said yes. I asked if he accepted Dr. Symes as an expert and he said absolutely.. I asked what he thought (about) Dr. Symes reputation and Dr. Smith said he was he was very happy when he learned Dr. Symes was going to look at the child's remains as in Dr. Smith's view Dr. Symes is the leading expert in North America on tool marks and markings on human bones. I explained that the reason for my call was that we were going to review the whole file tomorrow and I needed his input in light of Dr. Ferris' report which we go in October 00, Dr. Symes report and other info since our last meeting. He said that in his view he realized that we would have a real difficulty with meeting (as he put it a test of the probability of conviction). He confirmed that he has still not located the x-rays. Also during the course of the conversation he mentioned the fact that he had in the interim met with the defence counsel. The only thing he mentioned about the meting was that he had many of the same questions but that (he)also asked about blood testing relating to the respective injuries vis-a-vis the total number of injuries (one issue was in the context of the neck injury). He told them that in his view he couldn't reach any conclusions about the amount of blood loss of one or two particular injuries compared to the total number of injuries. He wished me good luck at the meeting and said this is one case he wished he had never seen. Bradley's interview with Dr. Smith appears to have incurred the wrath of the Kingston police service. "Ed Bradley phones Smith - questions him at length - puts possible causes of certain injuries to him - gets Smith to basically tell him he really didn't look close at the excised scalp which may have assisted in determining several sharp incised wounds at that location - as well he gets Smith to say that it will be very difficult now to meet the test of the probability of conviction. A: "I'VE SEEN DOG WOUNDS. I'VE SEEN COYOTE WOUNDS. I'VE SEEN WOLF WOUNDS. I RECENTLY WENT TO AN ARCHIPELAGO OF ISLANDS OWNED BY ANOTHER COUNTRY NEAR THE NORTH POLE AND HAD OCCASION TO STUDY OSTEOLOGY AND LOOK AT PATTERNS OF KILLING FROM POLAR BEARS. One of the systemic issues the Inquiry must deal with is the relationship between police officers and pathologists in our adversarial system of criminal justice. Is it permissible, for example, for police officers assisting to Crown to provide "dirt" on the pathologists who are assisting the defence so that prosecutors will be able to decimate their evidence at trial. The issue is squarely raised in Sharon's case by a police officers notes of a meeting on September 18, 2000, between Detective Kennedy and Prosecutor Ed Bradley on one hand and Doctors Charles Smith and Robert Wood who had provided the opinions that Sharon had died from stab wounds. Ferris - (Defence expert H.L.) - not allowed to do autopsies in B.C. (Smith will stand by his cause of death re deep wound)The Overview Report also tells us that in or around June 2000, Dr. Wood sent an email to David Sweet of the Bureau for Legal Dentistry which underlined the importance of the systemic issue. "Dear David,..." The letter begins. "Can you give me the name of the Crown from Saskatoon who invigilated (sic) Dorion this year? If you can also cite the case that would be a big help. I've received some information from Stan Kogan about a case Bob did ages ago in Northern Quebec which has come under some sort of judicial review. It seems that Bob may have cooked some data. The Crown and the cops in Kingston have asked me to so a hatchet job on Dorion so any help you can offer (in extreme confidence) would be most helpful." The Overview Report also notes that, "On June 5, 2000, Mr. Sweet responded to Dr. Wood's email, providing him the name of the case in Saskatoon and the name and contact information of the Crown counsel. Mr. Sweet asked "Bob," *please* keep me informed of your progress. I love this!" Associate Chief Justice Dennis O'Connor has turned down a motion brought by the Kingston Police Service to declare that two documents relating to the prosecution of Sharon's mother cannot be considered by the Gough inquiry because they are privileged. The first document is described in Justice O'Connor's ruling as, "a memorandum, dated April 18, 2000, from one of the investigating officers to the Crown Attorneys prosecuting the case." O'Connor says in his ruling, dated November 20, 2007, that the first document may shed light on the dangers of "tunnel vision" in criminal investigations and prosecutions where pediatric forensic pathology plays an integral role in proving the case - particularly where there is a disagreement among the experts or the experts are revising their opinions. He ruled the second document is important to the Commission in identifying how the Crown and the police were approaching the complex and changing pathology evidence in preparation for trial. "It appears from the notes themselves, that the prosecution team was preparing other forensic evidence to demonstrate the possible role of the dog," O'Connor said. A previous posting of this Blog ran Prosecutor Bruce Griffith's entire address to the court on withdrawing the charge against Sharon's mother. Well, almost the entire address. The Overview Report, prepared by Commission staff, says that according to the article, Dr. Young told the paper that, "the statement read by Mr. Griffith was altered - at Dr. Young's request - to remove statements "which incorrectly linked the decision to exhume Sharon's body in the summer of 1999 to the loss of the casting of her skull." "Dr. Young also told the paper that, to the best of his knowledge, "the (lost) x-ray and the casting had nothing to do with the withdrawal of the charges." "Young said he has completed an investigation into the disappearance of the evidence and he has ordered another probe that will focus on Smith's conclusions about how the child died. He acknowledged the statement read in open court yesterday by Crown Attorney Bruce Griffith was altered at his insistence that two paragraphs referring to the missing evidence be removed. "Shortly after learning that the casting had been misplaced, the Crown, after consultation with the Chief Coroner's office, obtained an order to have the body of the deceased child exhumed," reads one of the excised paragraphs. The chief coroner said the draft incorrectly linked the decision to exhume Sharon's body in the summer of 1999 to the loss of the casting of her skull. "The lost evidence was not the motivation for the exhumation," Young said. The decision to exhume the body followed his office's discovery that there was a growing dispute about what role a dog may have played in Sharon's death, he said. "I think my office acted very appropriately in raising the issue with the police and the Crown Attorney, encouraging the exhumation, carrying out the exhumation," Young said. The missing X-ray, taken during the first post-mortem examination, may still be at the hospital.t or how, but it was lost n the X-rays at Sick Kids," he said. Young said he told hospital officials that in future, exhibits must be segregated from other sample, and kept in a secure place "We want much greater care taken in the handling of exhibits," he said. "They're aware of the need to improve this area." More important than the lost material, Young maintains, is an independent review of Smith's initial conclusions that the girl was murdered and that a dog did not attack her. "Whether Dr. Smith's view, initially, is supportable, is the purpose of having the review," Young said, adding that Smith has voluntarily withdrawn from conducting forensic investigations for the Office of the Chief Coroner...Young said he decided Wednesday, when he learned that the Crown would withdraw the murder charge, that an internal review was needed. "Likely what I will do is have an external reviewer, an expert in pediatric pathology, review the case for us and give us their views on it" Young said. "It was my initiative." The Whigg-Standard story was published the day after Griffith withdrew the second-degree murder charge against Sharon's mother. The Overview Report says that, "On January 24, 2001, it appears that Mr. Stewart (a prosecutor H.L.) faxed Dr. Young a draft version of the submissions regarding the withdrawal of charges against (Sharon's mother)." The Overview Report also tell us that there were "differing reports" about how the misplaced cast of the penetrating wounds the skull bone affected the decision to conduct an exhumation and second post-mortem examination. "Some of the parties contend that the exhumation and second autopsy were ordered because Dr. Smith misplaced the cast taken at the original post-mortem." "The reasons for the delay?" McKenna told Court. "Of course, the preliminary, in this mater, with other counsel, dragged on for weeks, which caused a delay. And then new counsel was brought on, which resulted in a further delay, as they brought themselves up to speed on this file. From there, there was considerable difficulty in obtaining the essential material from the previous defence counsel - which has really just been completed now, I understand. And then, very recently, I was advise that the pathologist who testified at the preliminary...a certain piece of evidence which was introduced at the preliminary, he was allowed to take that away with him, and he's lost it. So we're now into a further investigation - and, in fact, I've made an application to Attorney General (sic) to exhume the body, and that is going to cause some further delay." The Overview report also notes that, "in reasons refusing the motion for a change of venue on June 26, 2000, Justice Lally stated, "Because of misadventures in the Coroner's office, Sharon's body was exhumed in July, 1999." To this humble Bloggist, the reasons for the exhumation are of secondary importance. The question as to to why Dr. Young - either as Chief Coroner of Ontario or as Assistant Deputy Minister in the Ministry of the Solicitor General - was allowed direct input into the withdrawal of the charge by the prosecutors is, at least in my personal view, of greater significance. Commissioner Goudge is required to make systemic recommendations which will improve forensic pediatric pathology in Ontario and restore public confidence in the Coroner's system. I wonder how the public can have confidence in a system in which the Crown's office, the Chief Coroner's office, and the Ministry of the Solicitor General appear to be so intricately intertwined. The apparent conflict is all the more serious, in my view, as many of the cases involving Dr. Smith involved allegations both against the police (who come under the ambit of the solicitor general), the Coroner's office (also under the Solicitor general), and the Attorney general and its prosecutors. I am also troubled by Dr. Young's reported comments that he intended to make known to the Hospital for Sick Children the need to improve its system for safe-guarding forensic exhibits. We know from the Mullins-Johnson case that the Hospital did not put in a system for safeguarding, protecting and tracking exhibits sent to the pathology lab from outside the hospital until 2004, when former Chief Coroner Dr. Barry McLellan began tracking down the missing exhibits from Valin's autopsy. If the Hospital had been put on notice that it had to take action back in 2001 why was nothing ever done? Lastly, Dr. Young gave assurance through the Whigg-Standard that an independent review would be conducted. That review never took place. On January 25, 2001 - almost four years after Sharon's tragic death - Prosecutor Bruce Griffith withdrew the second-degree murder charge facing Sharon's mother in a Kingston, Ontario courtroom. Griffith told Justice Helen MacLeod that his comments in withdrawing the charge were in the public interest, "and the public has a right to know." The Charles Smith blog is therefore presenting Griffith's address to the court in it's entirety. "Your honour as you are aware this case is set to proceed to trial on February. 12, but the Crown has requested this earlier court date. as there have been a number of developments in the Crown's evidence on this particular charge," Griffith began. "As a result the Crown would like to address the Court with the understanding that the comments to be made are stated in the public interest snd the public has a right to know. On June 12, 1997, the body of 7-year-old (Sharon) was located by the police in the basement of her home in the City of Kingston. The body was covered by over 80 (eighty) wounds. It was determined that a pit bull dog had been present in the basement. The Kingston police had initially become involved because the child was reported missing. Once the body was located, they commenced a very comprehensive investigation interviewing in excess of ninety (90) witnesses. The accused before the court was the mother of the child. As a result of information received through the various witnesses she became the prime suspect in the death as the investigation continued. In the meantime, the post-mortem examination of the deceased child had taken place and a number of items retrieved at the scene were sent for expert examination. It was after receiving verbal reports from Dr. Charles Smith, a pathologist specializing in pediatric pathology from Sick Children's Hospital in Toronto, and Dr. Robert Wood, a forensic ondontologist with expertise in bite marks who had consulted with Dr. Smith, that the child's death was considered to be a homicide. Dr. Smith had performed the autopsy. The pathologist was made aware that there was a dog with something red on it observed at the scene. No paw prints were observed anywhere near the body. While there was still the issue of whether the the dog could have been involved, the police were notified at this point in time that both Dr. Smith and Dr. Wood appeared unequivocal in their opinions that the wounds on the body were not dog bites. Indeed , Dr. Smith went further and stated they were stab wounds. In the Crown’s view, the Kingston police had conducted a thorough and comprehensive investigation of the evidence available and relied on this expert’s opinion as to the cause of death of the child. There was also a report from the Centre of Forensic Sciences indicating that a transfer mark on a white T-shirt worn by the child appeared to be from a sharp-edged instrument. After receiving the opinions of Dr. Smith and Dr. Wood, the Crown was eventually presented with short one-page reports from Dr. Ferris, a pathologist, and Dr. Dorion, an ondontologist, both retained by the defence. Both doctors were of the view that the wounds were due to dog bites. In accordance with the law a preliminary hearing was held. It lasted for four days in April, 1988, and a total of ten days in the months of August and September 1998. The Crown had proceeded to the preliminary hearing with an apparent provable case comprised of a combination of circumstantial, expert, and supporting evidence. As a result of the evidence called at the hearing a judge committed the accused to trial on a charge of murder. A substantial portion of the Crown’s case was presented at this hearing. Dr. Smith’s evidence became a central focus of those court proceedings. Dr. Smith testified that in his opinion the child died due to blood loss from stab wounds probably caused by a pair of scissors and certainly not dog bites. His evidence was clear and unequivocal in that regard. The testimony was pivotal to the whole case as other Crown evidence took on a significant importance in the context of the child's death being caused by stab wounds. After Crown and police discussion with the Office of the Chief Coroner the Crown made an application for an Order to have the child's body exhumed. The Court granted such an order. It was at this time that the new defence counsel came forward with an appropriate proposal for bail. Due to the delay that would be caused by the exhumation and the second examination of the remains of the child, the Crown felt it was in the best interest of the administration of justice that ail should be granted, and the Crown, therefore, agreed to bail. post-mortem, which took place on July 13, 1999. Also present at this procedure were Dr. Ferris, Dr. Dorion, Dr. Smith and Dr. Wood. After the second post-mortem examination, Dr. Smith and Dr. Wood provided the Crown with amended reports. In his report Dr. Smith stated there were marks consistent with dog bites but nevertheless still held the opinion there were significant wounds that were not consistent with dog bites. Dr. Wood’s view was consistent with Dr. Smith’s. In the Crown's view, at this point in time, a reasonable prospect of conviction continued to exist with the reduced number of stab wounds on the basis of the scientific evidence and the other Crown evidence available. It was relevant that Dr. Smith had personally conducted the main autopsy, when the entrance wounds and the surrounding skin were still intact. Dr. Smith was the only expert who had the opportunity to to examine the deceased child before any significant degradation of the body had taken place. The state of the remains had deteriorated in the intervening two years to the extent that the second autopsy was primarily an examination of marks on the skeletal remains. However, in the last few months there have been a number of new and significant developments that have resulted in the Crown requesting that this case be listed for court today. Mr. Bradley, the Senior Crown Attorney assigned to this prosecution, met with Dr. Ferris,the expert retained by (Sharon's mother's) counsel, in Vancouver on August 8, 2000. The purpose of the meeting was to discuss some of the Doctor's conclusions on the case. Dr. Ferris advised Mr. Bradley that in addition to the one-page report that the Crown had been given, there was in existence a five-page report prepared by him that the Crown would have to obtain from defence counsel. On October 3, 2000, defence counsel did, in fact, provide the detailed report of Dr. Ferris to the Crown. An application by the Crown had been made in April, 2000, for disclosure of all reports of expert witnesses retained by the defence. Once the defence decided to voluntarily provide the specific report it was reviewed by the Crown in assessing the totality of the evidence. On Wednesday, November 10, 2000, a new report was received from Keith Kelder of the Centre of Forensic Sciences. In his report, and in subsequent conversation with the Crown's Office, Mr. Kelder raised the possibility of explanations (other than cutting instruments or weapons) for straight-edged transfer patterns on material found at the scene. Furthermore, his report of November 2000 excluded all cutting instruments submitted in the case by the police. These items had been seized from the child's residence. In the meantime, the Office of the Chief Coroner had determined that the leading North American expert in tool mark Department of Pathology, was available and willing to examine the skeletal remains and the cutting instruments seized by police. In conjunction with the Crown, the police and the Chief Coroner's office, it was arranged for a police officer to take directly the skeletal remains of the young child to Dr. Symes' laboratory at the University of Tennessee for examination. Subsequently, On December 11, 2000, the Crown received a report from Dr. Symes. Dr. Symes' opinion, as revealed in his report and in subsequent conversation, is that the visible marks on the skeletal remains were caused by dog bites, except for eight or nine marks on the skull. Of these markings, six or seven were described as incisions on the skull and were, in Dr Symes' opinion, caused by a scalpel or a very sharp knife. Dr. Symes examined all of the cutting instruments seized by the police and he excluded all of them as being the cause of the marks on the skull. The remaining marks on the skull were a couple of scrape marks that he said were less likely to be caused by a scalpel. Dr. Symes could not eliminate a dull scalpel or thin edged knife. Once again, Dr. Symes clearly eliminated scissors or any other of the cutting instruments seized by police. He testified to this effect at the preliminary hearing. After the second post-mortem he changed his opinion to indicate that some of the wounds were dog bites and some were not dog bites. When he was presented with the new information from Dr. Symes, Dr. Smith then stated he deferred to the opinions of the other experts. Dr. Smith now says that there is a possibility that even these other questionable wounds could possibly have been caused by dog bites. The onus is on the Crown in every criminal prosecution to prove all of the essential elements of the offence. In this particular charge the cause of death is a very important fact to be determined. The Crown's case is dependent on clear evidence that at least some of the injuries were stab wounds that contributed to the young girl's death. After a careful review of the state of the evidence presently available we are of the view that the Crown no longer has proof that this death was caused by stab wounds and, therefore, no longer has a reasonable prospect of conviction. Therefore we are duty bound to withdraw this charge and we are consequently asking the court that the indictment be endorsed, “Charge withdrawn at the request of the Crown." Kingston police were angry and bewildered when prosecutors dropped the murder charge against Sharon's mother on January 25, 2001. The highly emotional inside story of the withdrawal is told in the "Overview Report" on the case prepared by Commission staff. We learn, for example, that the police made clear to the Crown prosecutors at a meeting held on January 15, 2001 - ten days before the charge was withdrawn - that they disagreed with the decision to withdraw the charge. We also learn that the day after the withdrawal, Kingston Police Chief Bill Closs said, in a letter to Chief Coroner Dr. James Young, that he wanted to share some of the notes he made in preparation for a radio interview. One of those notes describe Dr. Smith as, "a doctor who had the courage to at least try and who offered an opinion, and somehow the process of how we use so-called experts allowed unchallenged, differing opinions to beat up on this pathologist." "After what this doctor has been through, why would others ever want to put themselves through that?" Chief Closs concluded that, "Dr. Smith is a well-respected doctor who was assisting the police and the Coroner's office in very complex and tragic investigations, and it would appear that the current processes in place do not afford experts such as Dr. Smith the protection and support they so very well deserve." Closs later wrote former Chief Coroner, Dr. Barry McLellan, that, "(At) the time the trial was halted, the officers were of the opinion that the decision to halt the trial reflected the wishes of the Crown Attorney and Coroner's offices, at the expense of the Kingston police."" "In other words, the perception was left that the decision to halt the trial was based upon a desire to protect the Coroner's office because Dr. Smith's loss of a piece of evidence and subsequent change in opinion given at the preliminary hearing..."
In a subsequent letter, Closs told McLellan that, "The investigating officers were not included in the decision to withdraw the charge and believed at the time that the real purpose was to protect the government." With all due respect to the Kingston force, Sharon's case tells us why decisions to withdraw charges must be left to prosecutors - and not to police officers who laid the charge and thereby have, or may be perceived as having, a vested interest in the continuation of the prosecution. But the immense power of Dr. Charles Smith over other people - including skeptical police officers - is illustrated by the fact that the Kingston police still were in awe of him - even after his findings had been so thoroughly eviscerated by legions of other experts. We learn that the force initially were troubled by the fact that Smith had changed his opinion that Sharon had suffered about eighty stab wounds from scissors and knives when confronted by the opinions of a battery of defence experts all of whom siad that the wounds were inflicted by a dog. Goudge Inquiry: Sharon's case: Part Two; More Revelations; Smith Claims Solicitor General Agreed "to back me." In the letter, under the heading "media problem", Smith says that he, "like Dr. Cairns, (Deputy Chief Coroner H.L.) and Dr. Young (Chief Coroner H.L. )", believe that a statement the Crown attorney was going to read into court on withdrawal of the charge was "misleading" and "was going to be a bombshell." We learn for the first time from this letter that Dr. Smith decided just hours before the charge against Sharon's mother was withdrawn that the best way to handle the "problem" was for him to ask to be excused from performing medico-legal autopsies - and to ask for "a review" of his cases. The letter raises grave concerns that the Chief Coroner's office may have become politicized to a disturbing degree. "Alan, Jim Cairns, the Deputy Chief Coroner, is going to telephone you early this afternoon," the letter begins. "I am writing to request that you excuse me from the performance of medico-legal autopsies for the Office of the Chief Coroner and that you arrange for an external review of my post-mortem examinations;"
While the case in question had no direct involvement with Sick Kids (apart from Bairbre Connelly reading the x-rays,) just because I work here, there may be media inquiries about a case in Kingston where the murder charges are being dropped today. Here is the case, in a nut shell. In June 1997, 7-year-old (Sharon) was sent home from school because of head lice. Some hours later, her mother reported her missing, and police found her body in the basement of her home, having been scalped and bearing numerous puncture wounds which had the appearance of stab wounds. A weapon was not found, but it was suspected that a pair of scissors may have been used both the (sic H.L.) scalp the girl and to cause the puncture wounds. I (reluctantly) performed the post-mortem examination at the Coroner's building. Sometime later, the question arose as to whether the puncture wound could have been caused by a dog. Because I have no expertise in bite marks, Dr. Robert Woods, who serves as a forensic ondonologist for the Chief Coroner, was consulted. He reviewed the materials and wrote a report dismissing the possibility. I subsequently wrote an autopsy report attributing the death to multiple wounds. Subsequently, defence experts continued to postulate that the injuries were due to a dog attack. The body was exhumed and a second autopsy was performed by Dr. David Chaisson, the Chief Forensic Pathologist of Ontario, and Dr. Woods. In July 1999, Dr. Woods examined the bony injuries and wrote a report attributing some of the marks to dog bites and some were inconsistent with dog bites. Dr. Chiasson concurred with this opinion. I reviewed the materials and wrote a supplementary report agreeing that some injuries were consistent with a dog and some were inconsistent with a dog bite. The bones were then sent to Dr. Stephen Symes at the University of Tennessee (who is probably the nation's leading expert on tool mark evidence on bones). He stated that some of the injuries were consistent with canine injury, and some of the wounds were caused by a sharp instrument like a knife or scalpel. The murder charge against (Sharon's mother) are being dropped in court in Kingston today. The Crown Attorney is going to read a statement as why (sic H.L.) this action is being taken. Unfortunately, the statement appears to place the blame for the wrongful prosecution on me. I saw the statement last evening and like Dr. Cairns and Dr. Young, I felt it was misleading and was going to be a bombshell. Because it was written by lawyers for the Attorney General, Dr. Young, in his role as Assistant Deputy Minister for the Attorney General has no authority to substantially change it. We expect that it will be on the national media tonight and/or tomorrow. While the Solicitor General has agreed earlier in the week to back me, the statement being read in court will make his job very difficult. Dr. Young and the Solicitor General have agreed to this. Dr. Becker is not aware of these events, as he is away for two weeks. In his absence, I felt you should be aware of this. I will be in the autopsy suite this morning (completing an autopsy for Dr. Young, who is not going to accept my letter until it is over) but am free to speak with you if you so wish. Dr. Smith's lament that "unfortunately, the statement appears to place the blame for the wrongful prosecution on me," is also fascinating. His attempt to pass the blame for the wrongful prosecution on Dr. Woods is worth considering in the context of a recent story on the Inquiry by Globe and Mail reporter Kirk Makin, who as will be seen, obtained notes of a lengthy interview with Dr. Smith conducted by Maclean's Magazine reporter Jane O'Hara. Makin's story appeared on November 20, 2007, under the heading, "Dog-bite expert to blame, pathologist said." "Disgraced pathologist Charles Smith privately blamed a colleague for misleading him into making critical mistakes in a notorious case involving a Kingston child whose mother spent two years behind bars for her murder," the story begins. "The charge against the mother was withdrawn in early 2001, after the child's remains were exhumed and Dr. Smith conceded that she was mauled by a pit bull. The case revolved around the source of 80 cuts to the body of the girl, who is referred to as only Sharon. Based on Dr. Smith's opinion, the Crown alleged that the mother used scissors or a knife to kill her daughter in a rage. However, in a previously unpublished interview several months after the mother was exonerated, Dr. Smith heaped blame for his error on Dr. Robert Wood - a colleague in the Ontario Chief Coroner's Office. "He collected dog heads for months - pit bull heads - and he wrote a report in which I think his words were: 'The marks on the skin are absolutely inconsistent with dog bites,' " Dr. Smith said. "And it was only when he made that conclusion that I released my report." Dr. Smith's words are in marked contrast to his testimony three years earlier at the mother's 1998 preliminary hearing. At that time, he testified forcefully that he formed his own conclusions about the cause of Sharon's death without speaking to Dr. Wood or seeing his report. Dr. Smith testified that he was interested in hearing Dr. Wood's opinion on the case, but that he had already reached his own firm conclusions: "I didn't feel any doubt," he told the preliminary hearing. "It's not the tearing pattern that one would expect with a dog or coyote or wolf. I don't believe it's there." The difference in his two accounts provides new insight into aspects of Dr. Smith that his critics frequently raise: a tendency to be overconfident, overstate his opinions, and to blame others for his mistakes. The unpublished interview was conducted in 2001 by Jane O'Hara, a Maclean's magazine writer at the time. It was for use in defending a defamation lawsuit Dr. Smith had launched, but later dropped. Ms. O'Hara provided a transcript of the interview to The Globe and Mail. At several points in the four-hour discussion, Dr. Smith said that he would like to state something off the record, but Ms. O'Hara did not signal her agreement. Dr. Smith said that Dr. Wood's opinion was, in fact, very important to him because of his own inexperience with animal bites: "I'm not a dog-bite expert," he said in the interview. "I've got the province's dog-bite expert saying that these marks are absolutely inconsistent with a dog. "I've sat in meetings with Dr. Wood - I've sat there when he's displayed his collection of dog mandibles that he had obtained from the various humane societies in Ontario over a period of months, so that he could do measurements of these. I knew what his conclusions were." Dr. Smith also revealed that the Crown took measures to keep Dr. Wood off the witness stand as a trial tactic. "The Crown attorney chose not to put Dr. Wood on the stand," he said. "He didn't want to bring credibility to the dog-bite story when he felt that Dr. Wood, who is the expert on ondontology - bite marks - had discounted the possibility." But the tactic set Dr. Smith up for a fall, he told Ms. O'Hara. "I'm left holding the bag there," he said. "What would an equivalent be? A surgeon takes a breast biopsy from you, the pathologist looks at the biopsy and says it's cancer."